Outro marcador para o Dia dos Namorados. Usei novamente o carimbo de coração de Aud Design e o meu carimbo Field of Flowers from Stampabilities. 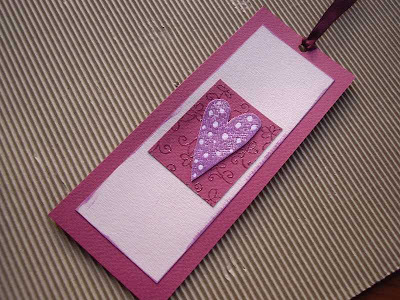 Another bookmark for St. Valentine's Day. Again, I used the heart stamp form Aud Design and my stamp Field of Flowers from Stampabilities. So pretty! Love the heart against the embossed background!